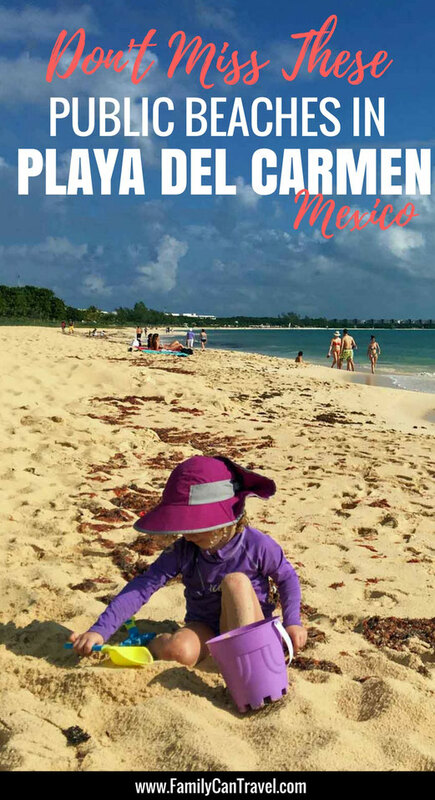 Our recent trip to Playa del Carmen was our first time in Mexico staying outside of an all-inclusive resort. I was excited about a more authentic trip, but I was worried about the quality of the non-resort beaches. I’m happy to report that this concern was unfounded and we enjoyed our time at many great beaches in the area. 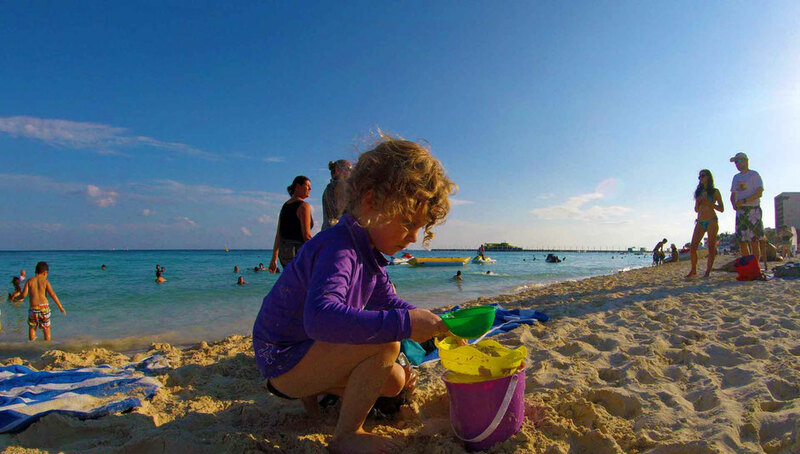 Because we were travelling with two small kids, Punta Esmerelda was easily our favorite beach in Playa del Carmen. It’s on the north-east end of town in a non-touristy part of town. This beach is still considered a ‘locals’ beach, but my bet is that it won’t be for long. There were plenty of tourists on the beach the times we visited and we felt safe and welcome each time. 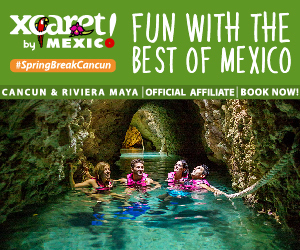 What makes this beach special is that there is a cenote in the middle of the beach. You can actually see the spot where the fresh water bubbles up into the small lagoon, where it eventually turns into a small stream that snakes through the sand into the ocean. 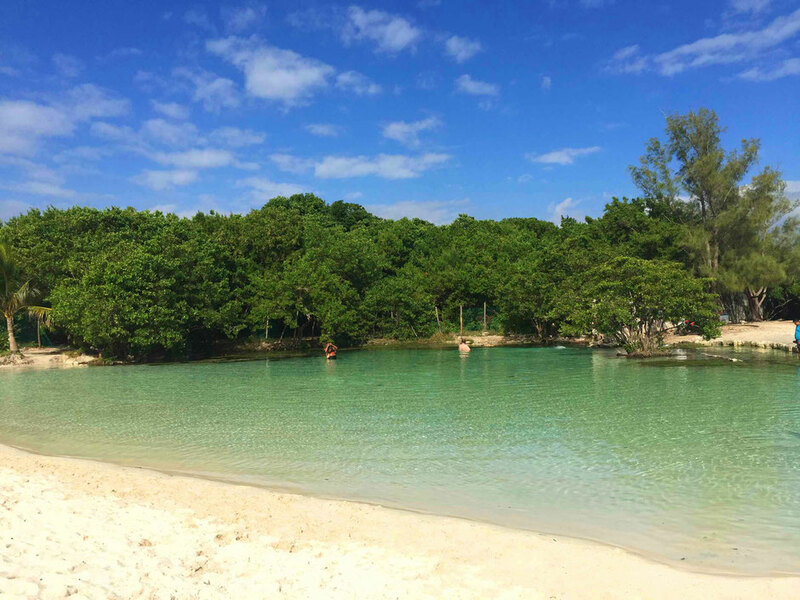 Most beachgoers here (including us) play in the cenote and not the ocean. The ocean floor had some rocks and seaweed in spots, but it still looked reasonably hospitable for entry. This beach is partially protected from the open ocean, hidden nicely by a point jutting out in the ocean, which helps makes the waves quite small as they come to shore. 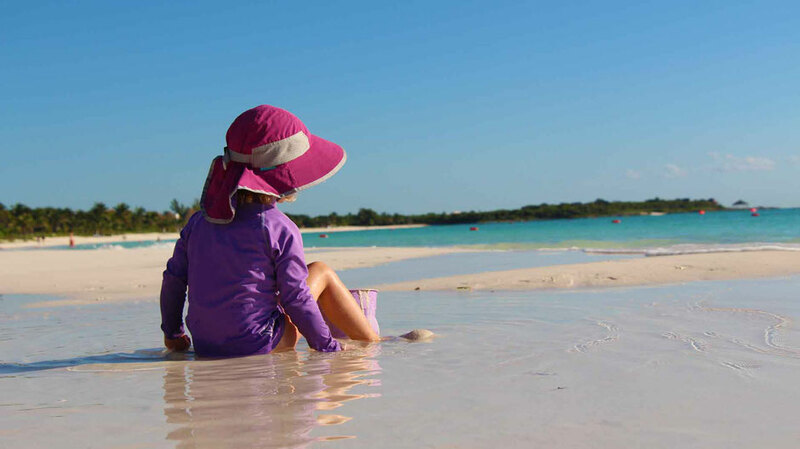 The water also stays shallow for a long time, making it nice for smaller kids. 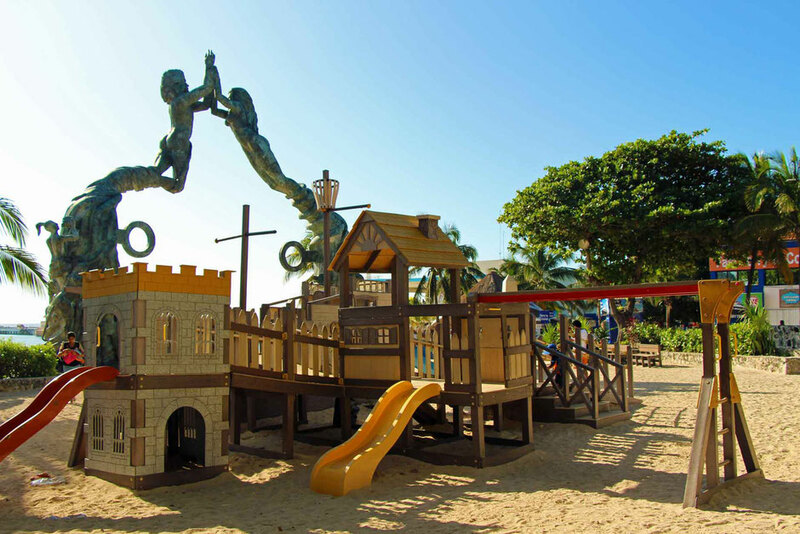 For facilities, there is a playground, public bathrooms (10 pesos) and a permanent food truck with a large seating area. Getting there: (MAP) Another benefit of coming to this beach is the chance to drive through the part of town where the locals live. It’s a 15-20 minute cab ride from the main ferry pier in town. If you drive there, take 10 Avenida Nte, turn right on Calle 112 and then right on Calle Quinta Avenida. Drive for a few blocks and then turn left on the access road towards the beach. The access road is not on Google Maps yet, but trust us, it’s there (you can see it in satellite view). There is a small parking lot at the end of the road, or you can park alongside the access road. Come to Playa Mamitas if you like to be close to the action. 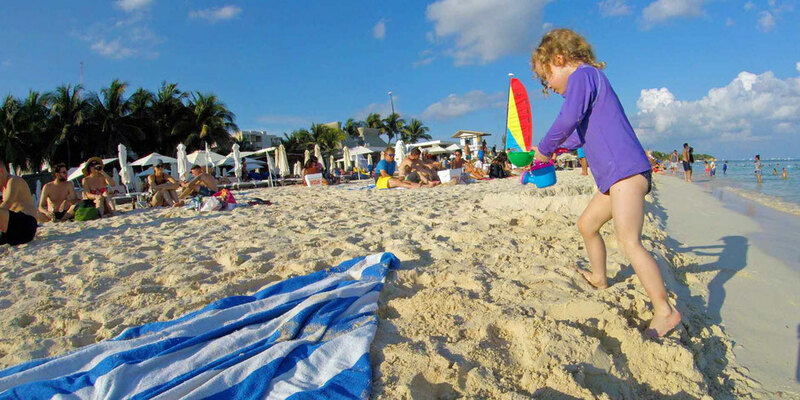 This is a popular beach, with music playing at the nearby beach club and lots of activities going on. Mamitas Beach Club is a large facility just behind the beach which offers sun beds for rent, food and a family area with a kid’s pool. The beach itself was really nice with deep sand and no rocks to be found on the ocean floor. The water was warm and calm on the day we were there. 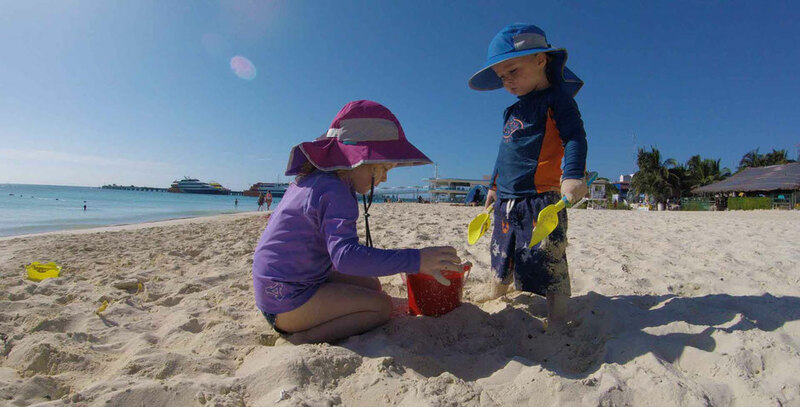 Both kids had fun playing with their beach toys and going into the deeper water with a parent. Getting there: (MAP) It’s a 15 minute drive or a 22 minute walk from the main ferry pier. Given the relative indifference on time, you may as well have an enjoyable walk along the pedestrian-only Calle Quinta Avenida. 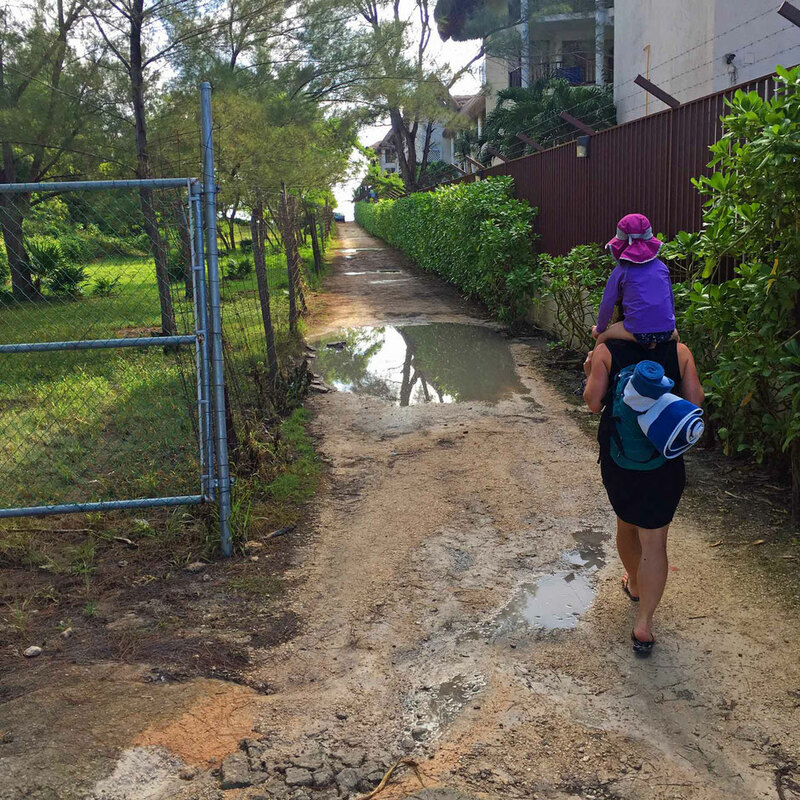 To access the beach, turn right on Calle 28 Nte. 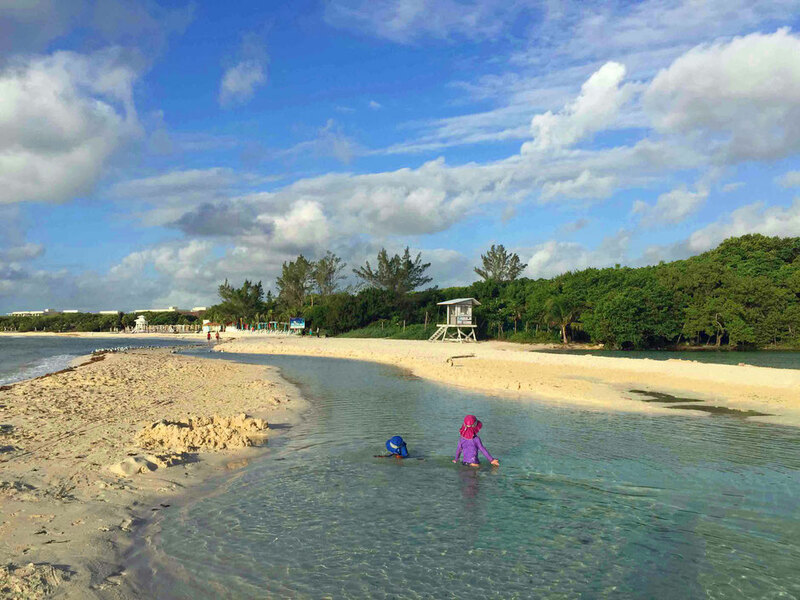 If you need a break from the throngs of tourists, Coco Beach is a good place to escape for a while. This is a true local’s beach, where we didn’t see a lot of other tourists. Again, we felt very safe and welcome during our time here. The beaches immediately south of here are super crowded with tourists. The reason Coco Beach is so quiet is because The Reef Coco Beach Resort is at the south end of this beach; it juts out into the water, forcing beach walkers south of the resort to turn around and go back. 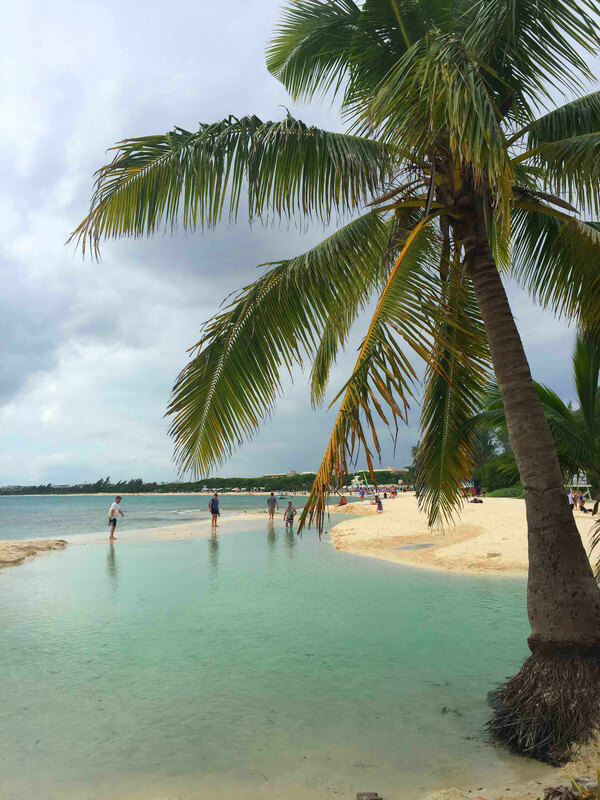 This beach is backed by jungle, so there are no resorts behind you. While this is great in many ways, the one downside is there is no resort staff to clean the garbage and seaweed off the sand. We found the beach was a little dirty in spots, but nothing horribly bad. The waves were quite calm while we were there. Getting there: (MAP) You’ll likely want to take a taxi to this beach as it’s approximately a 40 minute walk from the ferry pier. Ask your cab driver to go to “The Reef Coco Beach”, on the corner of Calle 48 Nte and Calle Flamingo. There is a guard and a gate at the entrance of the resort, but don’t be put off, simply walk along the pathway on the left, past the guard to the end of the parking lot. 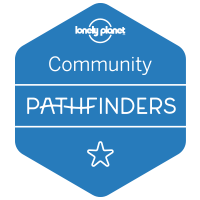 A pathway headed east towards the beach will reveal itself. Fundadores Park is immediately north of the main ferry pier. It’s the only spot in town that we could find a true playground. 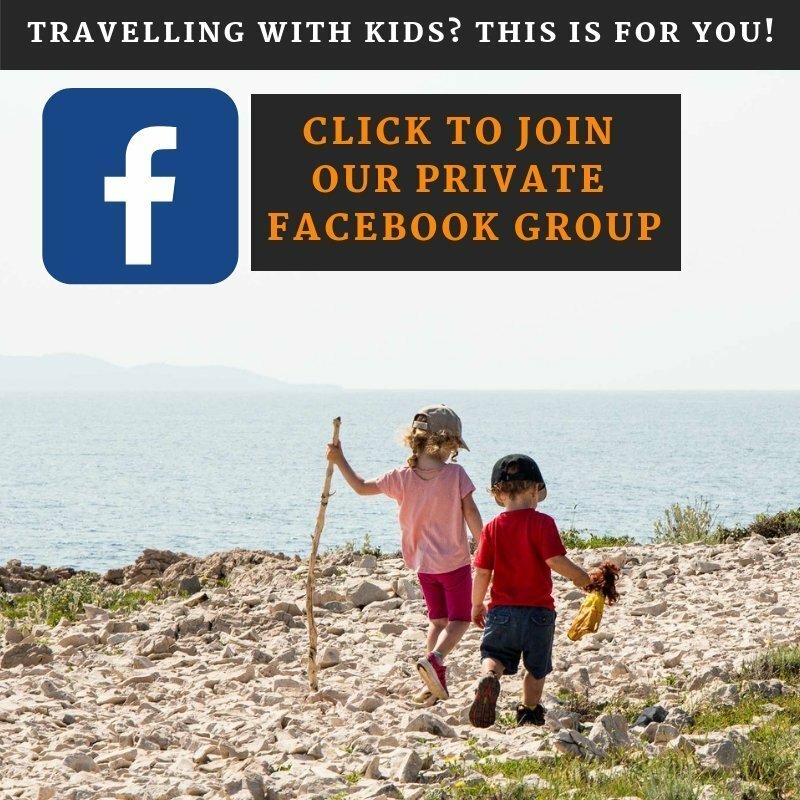 If your kids are looking for something fun to do outside of playing on the beach, this is a nice alternative. 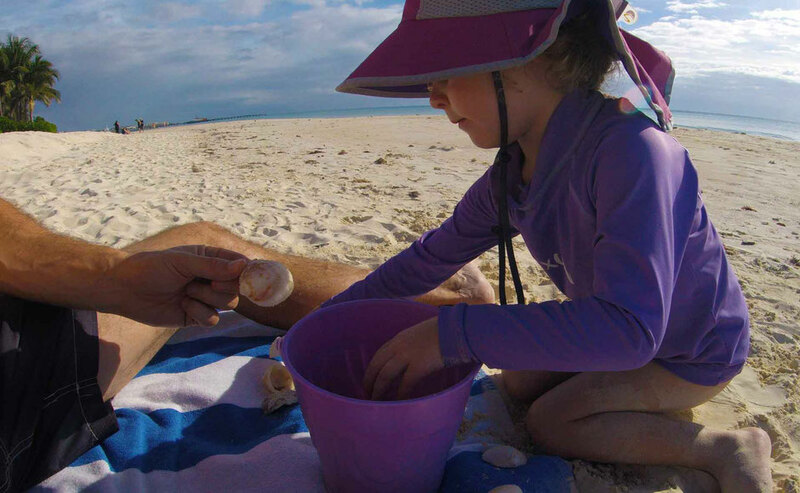 When your kids get bored of the playground, the beach is right next door. The beach is really deep, which makes it feel less crowded. The large, looming ferry pier doesn’t make for the best scenery, but I found it surprisingly relaxing watching the ferries coming and going to & from Cozumel – perhaps it was watching the commotion of all the tourists coming and going that made sitting on the beach extra relaxing? Occasionally the ferries make big waves, but other than that the water was tranquil. The surface under the water was smooth sand, with only the occasional rocks. Getting there: (MAP) Fundadores Park is one block north of the main ferry pier on Calle Quinta Avenida. There is a spot on the beach in-between Calle 4 and 6 Nte where there is a large rock jutting out of the water onto the beach. This was our favorite spot along the main beach, which we came to several times. We parked ourselves just SW of the rock as it was next to a nice, quiet restaurant and it was rarely crowded. The water was great, the sand under the water was perfectly soft and no one else parked on the beach nearby us. The kids enjoyed playing in the tide pools and chasing away the small fast-walking birds that like to congregate around the tide pools. Getting There: (MAP) This section of the beach is easily accessed from Calle Quinta Avenida. 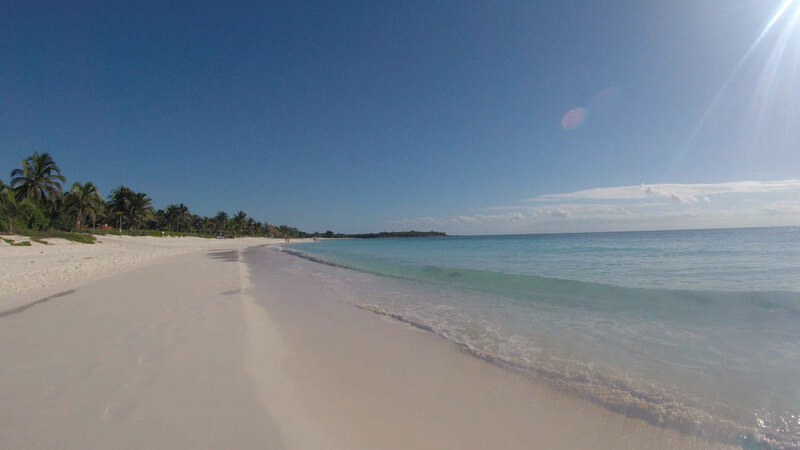 Simply turn towards the beach on Calle 4 Nte or Calle 6 Nte. 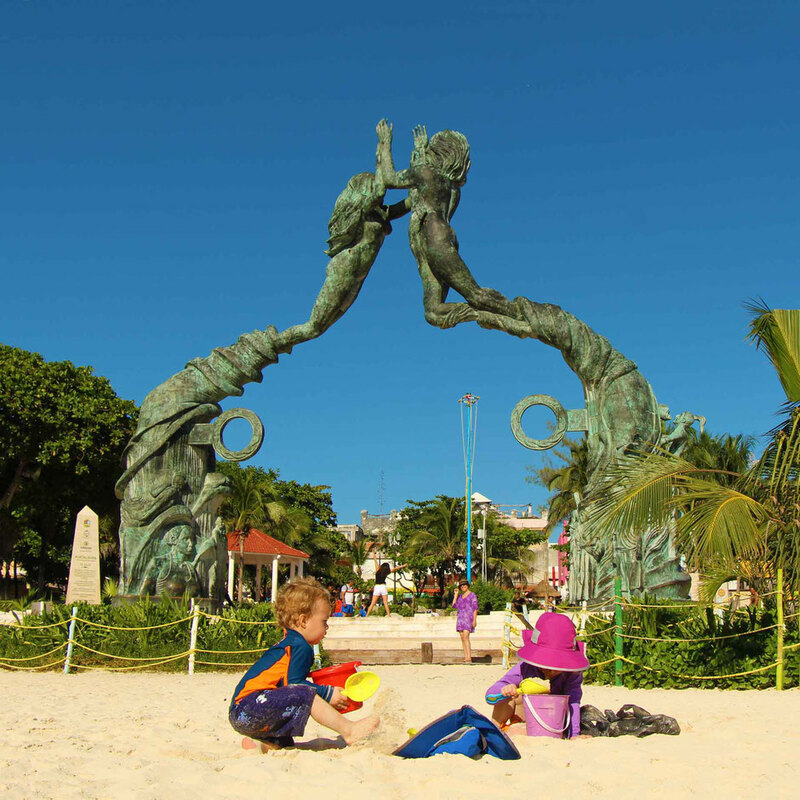 Playacar is a gated community south of the main ferry pier in Playa del Carmen. It’s a nice, quiet residential neighborhood with million dollar homes, intermingled with some large beach-front all-inclusive hotels. We parked on a quiet side street and walked right on to the beach. The stretch of beach in front of the houses was very quiet, with only a few other people there with beach towels. There is however, a decent amount of pedestrian traffic from the nearby resorts. 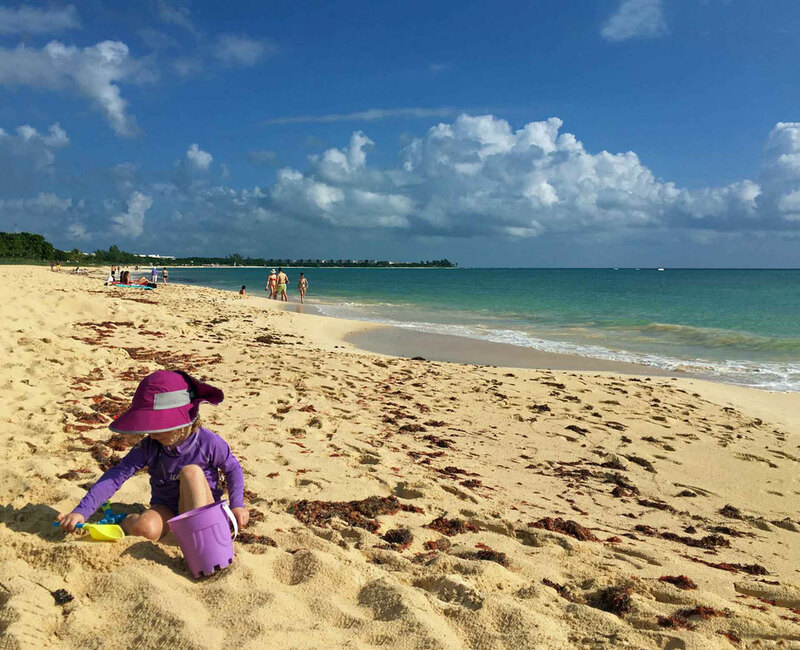 What made this beach special is that it actually had lots of seashells in the sand for our kids to pick up. Our daughter loved doing that so much she filled one of her sand buckets full. None of the other beaches so far had anything more than an isolated shell here or there. Also worth noting, despite not being in front of a hotel, this beach was being cleaned by a clean-up crew. I imagine the Playacar homeowners pay for this service, so I certainly appreciated it! Getting there: (MAP) Playacar is immediately south of the main ferry pier, so to get to the beach is an easy 15-20 minute walk or 4 minute cab ride. Based on suggestions we read from other travelers on TripAdvisor, we lied to the guard at the gate and told him that we wanted to see the Xaman Ha ruins (which reside inside the community) and he waved us through with no issues. Looking back, I imagine we could have gotten in without lying – if anyone has tried this approach, leave a comment and let us know how it went! 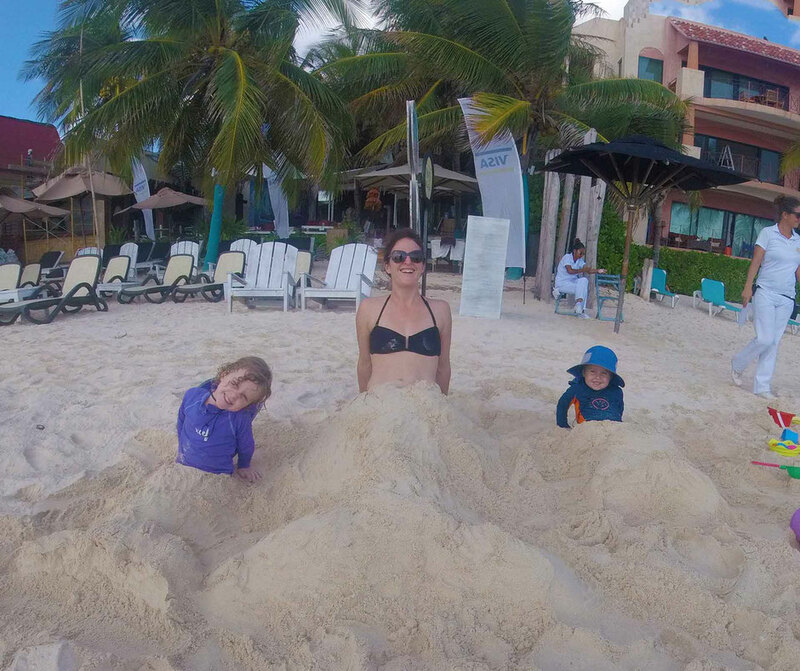 Xpu-ha is the best beach we have ever visited in all of our seven trips to Mexico. 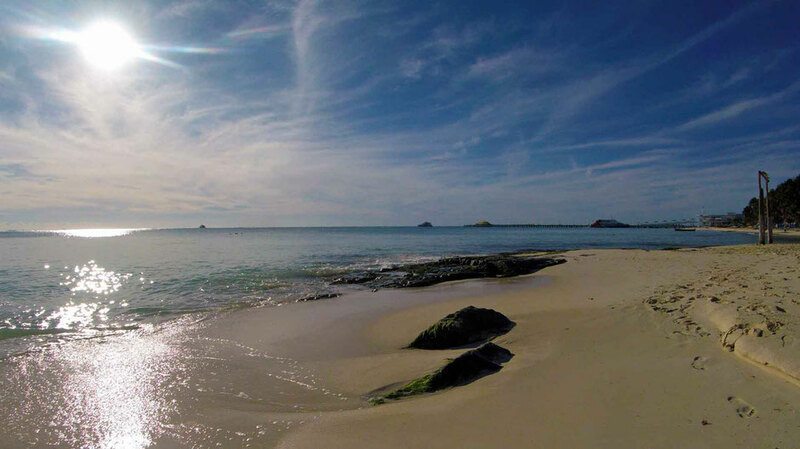 It’s a long, beautiful walkable beach along a subtle cove. 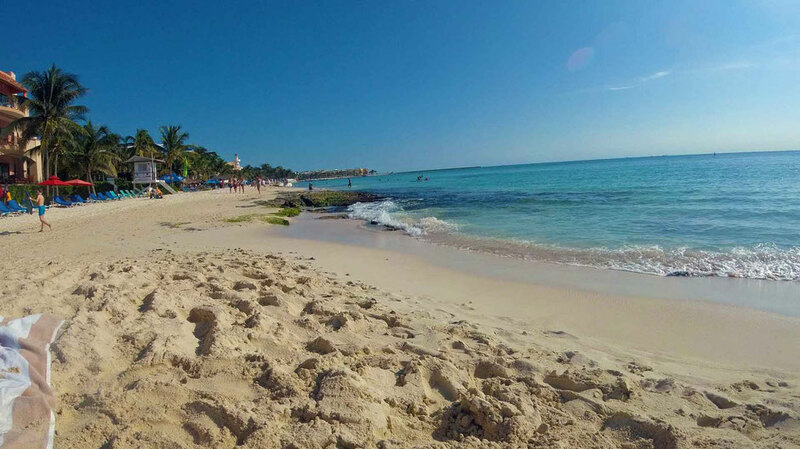 Despite there being a couple of resorts on this beach, this place felt practically deserted compared to the busyness of Playa del Carmen beaches. The waves were typically quite small here, even on windy days, and the water remains shallow for a long time. Our kids enjoyed the novelty of being so far from shore and still being able to touch. A nice sign of the natural health of this beach is that there are actual crabs that live there. They are just small ones which wouldn’t hurt anyone, but to be honest, I didn’t see a single crab on any other Playa del Carmen beach the whole month we were there. 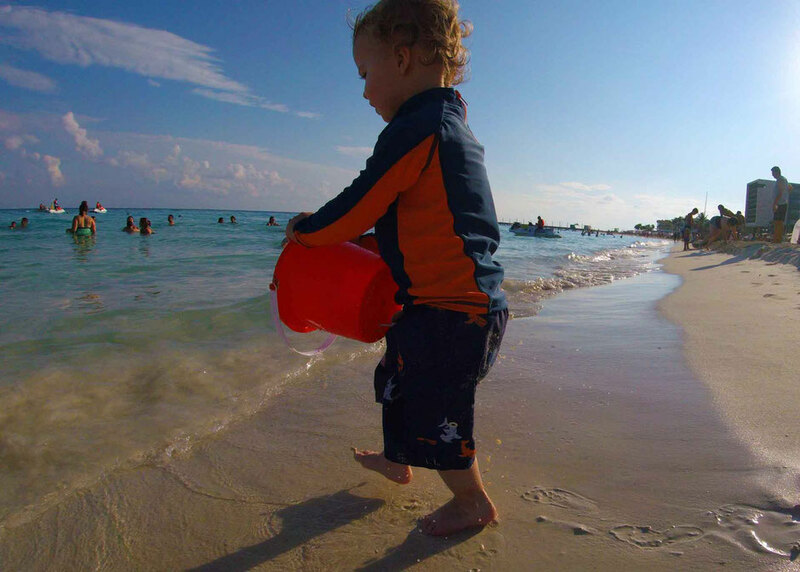 The lack of crowds gives you an opportunity to leave all your stuff on the beach and go into the water as a family – something I’d never do on a super busy Playa del Carmen beach. Despite the lack of crowds, there are equipment rental stands along the beach. The waves were tranquil enough here for Celine to try Stand-Up Paddleboarding for the first time. 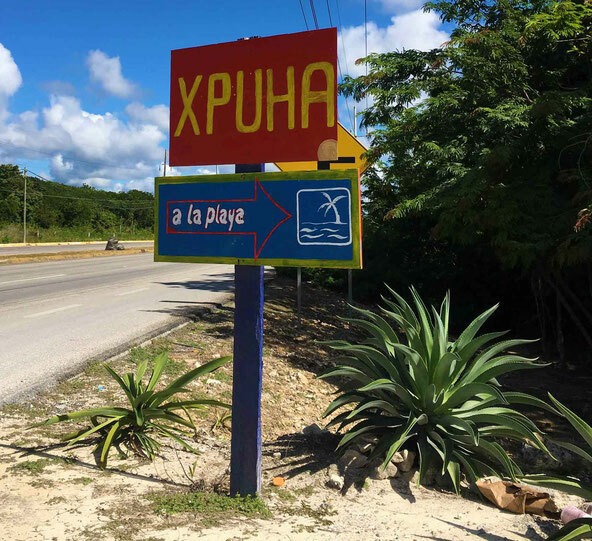 Getting there: (MAP) Xpu-ha is a 25 minute drive from Playa del Carmen. Drive until you see the Kantun-Chi eco-park, then one you pass the Pemex station (scam warning), take the “returno” to turn around. Get into the far right lane then take your third right – watch for the sign in the pictures below. Despite the fact the beach is public and free, you will need to pay a small fee to the landowners for the right to use their road to the beach. The toll is 30 pesos ($~2usd) per adult and kids are free. 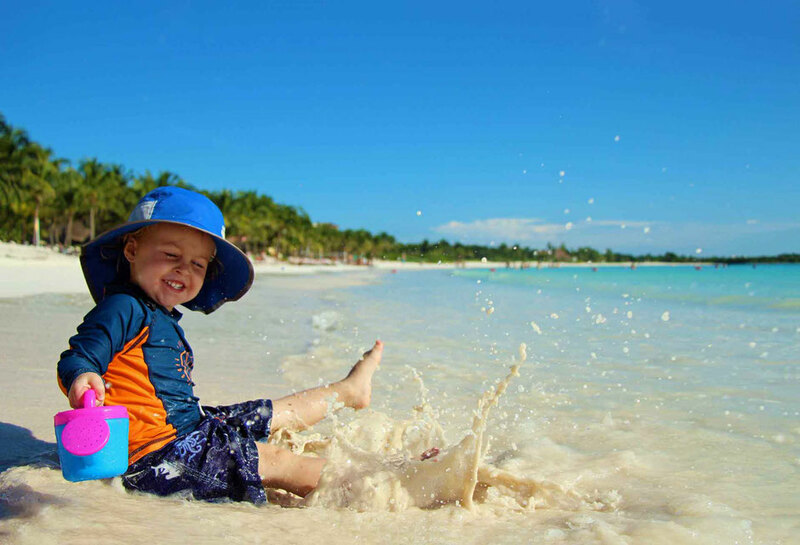 DON’T MISS: If you are currently in the Mayan Riviera or are planning a trip there, don’t miss our blog post, Plan the Best Family Trip to the Mayan Riviera. 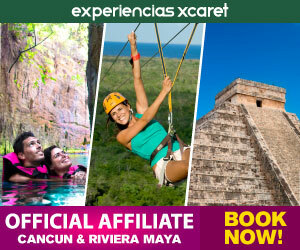 It’s packed full of planning tips, exciting family activities and links to all of our Mayan Riviera blog posts. 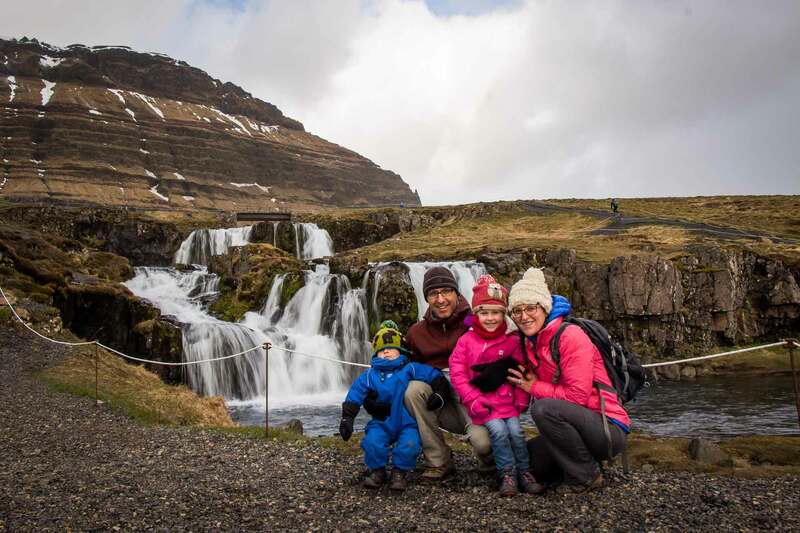 It’s sure to help make your family trip a memorable one!